Click on any of the links under Title to change them. The Description on the right will show you want will be changed. We recommend that you read through these prior to setting up your election as there will be some things you will want to setup first. This is the message that your students will see after they vote. So you can put a custom message in to let students know when the election results will be posted or any other message you wish you provide to your students. 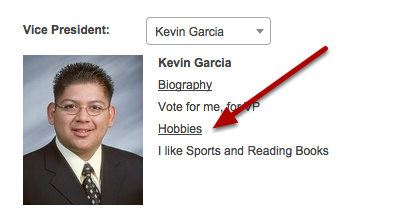 Changing the text on Biography will change the text that that a student sees for the the description. You can set the color theme here. This will change the header color as well as the text color. You can use this as a general match to your school colors. When you go into create an election, you are prompted to set a start time when students are allowed to done voting in your election. If most of your elections end at 3:00 PM for example, you can set your default end time to 3:00 PM and that will be the default time for creating elections. If you want to set an election to end at 11:00 PM you can change that when creating an election. When you go into create an election, you are prompted to set a start time when students are allowed to start voting in your election. If most of your elections start at 7:00 AM for example, you can set your start time to 7:00 AM and that will be the default time for creating elections. If you want to set an election to start at 9:00 AM, you can change that when creating an election. This is just a setting that gets set to Yes after you agree to it when you first login. This will determine the height of your pictures when you upload them. This will determine the width of your pictures when you upload them. 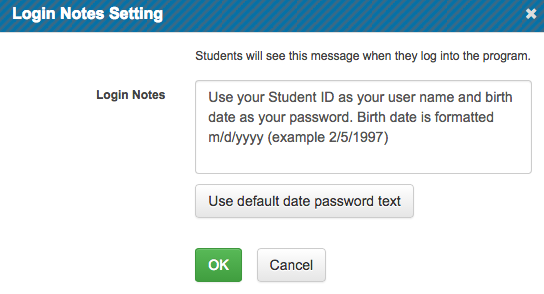 This is the message that will be shown to students when they login just below the user id and password fields. It is a good opportunity to assist you students with their login credentials. If you uploaded birthdays as their passwords and selected that option in the upload file, we recommend that you use the Use default date password text. This is a message we created to assist you students with entering in their password. This setting is not being used at this time. Notify Attempts can be set to determine how many time a student attempts to login before the admin is notified. Notify Attempts can be set to determine how many time a student attempts to login before the admin is notified. 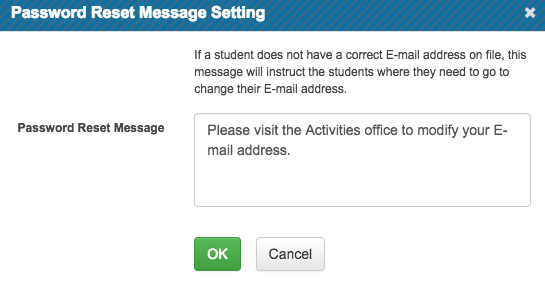 The Notify Email is to define what email address / who should be notified when students can not login. 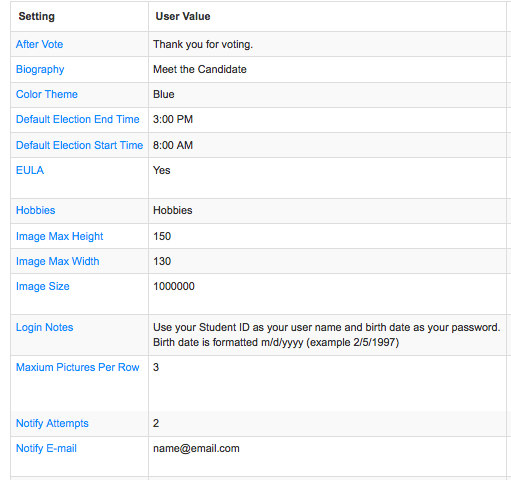 This is most useful when starting a new election and finding out that all your students can not login because the instructions might not match the user names or passwords that were uploaded. If you set this to Yes, when a student logs in the system will require the student to change their password. If you set this to Yes, the system will require you either upload an E-mail address or force a student to enter and verify an E-mail address when they login for the first time. This greatly improves security for your student accounts. If you are using the public results page, you can populate the results note with a custom message to your viewers. To change the titled displayed for your school name, use this setting. 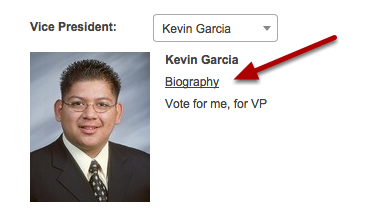 When a student logs into an election under the title you can display subtitle for your students. Be sure to set the correct Time Zone as we use this setting when a student logs in to check if any elections are available. Setting the text here will change what a student sees when logging in. For example if you are using student ID as the student User Name, we recommend that you change the text from User ID to Student ID.